Thank you to everyone who participated, coached, and volunteered running the event! Congratulations to our new state champions, and 8 new state record holders! 2nd Place Trophy. If you’re missing yours, please reach out, and we’ll make sure to get it [back] to you. Wendy Sipla’s Awesome Photo Stash has been added to the ITAA Shutterfly as the initial set of photos in the 2019 JOAD Indoor album. Including David Steffens’ 20-point Robin Hood in the 1/8 round of the Shoot Down! Brandon Hodge’s Awesome Photo stash Brandon Hodge brought out a range of photo and video equipment and put it to use capturing the event. These are fantastic! Thanks, Brandon! If you have photos or video from the event that you would like to share, please send them to photography@illinoistargetarchery.org, and we’ll post them here. 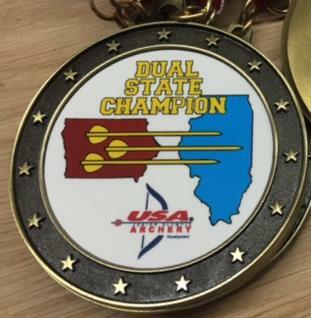 The ITAA is proud to hold this 2019 JOAD State Championship. This tournament is a chance for JOAD club members to compete against other JOAD archers from across Illinois and those traveling in from other states. Choose a venue and a date to show off your stuff! Registration is now Closed. The registration links are at the bottom to view the sign-ups. Contact Tony to be put on the waiting list. The format for the state championship is a JOAD 600 Round. In the northern venue, there will also be a head-to-head elimination tournament using the 600 Round results for seeding. This is 60 arrows at a standard 4-color World Archery target (40cm or 60cm, depending on your category). Awards will be given at the northern venue after the completion of competition. Awards will be mailed out for those not present. Registration closes Sunday, Feb 24th. Choose either venue. The scores will be combined together statewide. State Champions will be announced at the end of competition on March 3rd. All Compound competitors shoot on a 40cm target face. All Bowman and Cub Recurve and Barebow/Basic Bow competitors shoot on a 60cm target face. All Cadet and Junior Recurve or Barebow/Basic Bow competitors will shoot on a 40cm FITA target face. PRE-REGISTRATION IS REQUIRED TO RESERVE YOUR SPOT. YOU CAN PRE-REGISTER USING THE LINK BELOW. Trophies or Medal awards will be presented to the first three places in each category. Payments are online for the northern venue, and Cash or Check on site for the southern venue. The discounts for the northern venue will be handled as a refund after registration. Cancellations up to 5th 10th will receive a full refund less 20%. After Feb 10th there will be no refunds. There is a family maximum fee of $75 ($112 for late registrations). Family discounts on ITAA Event Fees are described at the link. “Final two weeks” here means “final two weeks before registration closes” (which is one week before the event). The shooting line has a maximum of number of spaces (But it’s a lot. I dare you to fill it). After that, registration will be closed and a waiting list will be created. For indoor shooting at a single 60cm target face, multiple archers may use the same target face. So you may be sharing a face with an archer on the other AB/CD line. A double-line 600 round takes around 3 hours shooting time to complete. With early arrival for check-in, shooting, and tear-down, plan on the 600 Round to require around 5 hours of time in your day. For the northern venue, the elimination round tournament will add several more hours of archery action. The JOAD State Indoor Championship will be requiring membership in a JOAD club for participation. All shooters will be eligible for medals regardless of registry method. We will be asking for your JOAD club name during registration to set up our team score keeping. The Rcherz.com site has some quirks regarding entering club affiliations that can delay displaying your club on the event list. As long as you’ve typed it into the registration form, we can retrieve it later when we go over the lists. We will follow up with entrants later if we cannot determine your JOAD club. Awards will be given in each of these categories. 2016 was the inaugural year for the Iowa-Illinois dual-state championship, and we’re continuing the tradition. This award is won by having the highest combined score in your category of both the Illinois JOAD State Indoor and Iowa JOAD State Indoor championships. The Iowa State JOAD Indoor Championships is February 16th, 2018. The winter calendar this year makes the Dual State event tricky. But it’s continuing! Registration is now Closed. The registration links are at the bottom to view the sign-ups. As always, you can sign up for either venue (or both, if you’re competing in multiple equipment categories). Contact Tony to try some other options. Please include the archer names and times of the sessions you are attempting to register for.